I would like to congratulate Hampton Inn & Suites Fort Myers Beach located at 11281 Summerlin Square Boulevard in Fort Myers Beach for being one of only 22 food service establishments in the Sunshine State recognized during the most recent inspections conducted by the Florida Department of Business and Professional Regulation for having no safety or sanitation violations within the past year. I applaud you and your employees for demonstrating such a high level of attention to detail and commitment to excellence. The work you are doing in your community is helping keep our state moving in the right direction. 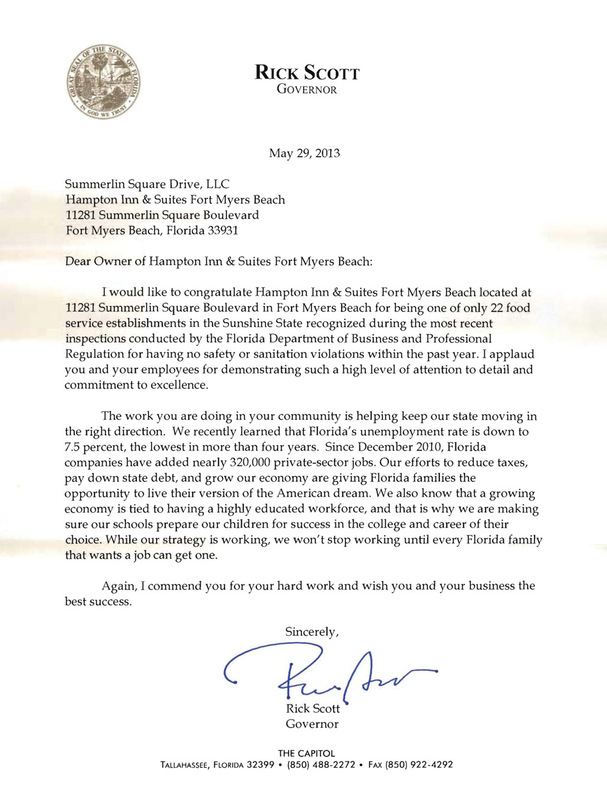 We recently learned that Florida’s unemployment rate is down to 7.5 percent, the lowest in more than four years. Since December 2010, Florida companies have added nearly 320,00 private-sector jobs. Our efforts to reduce taxes, pay down state debt, and grow our economy are giving Florida families the opportunity to live their version of the American dream. We also know that a growing economy is tied to having a highly educated workforce, and that is why we are making sure our schools prepare our children for success in the college and career of their choice. While our strategy is working, we won’t stop working until every Florida family that wants a job can get one. Again, I commend you for your hard work and wish you and your business the best success.